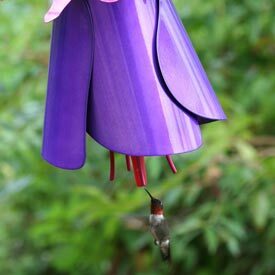 Lure hummingbirds to your landscape by the dozens with this unique, decorative feeder. 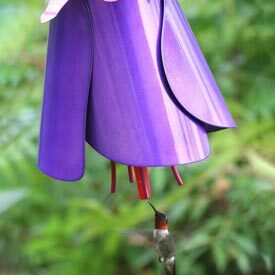 Specially designed and created to attract hummingbirds, this sculptural piece looks like a giant fuchsia flower (one of the hummingbird's favorite blooms) with bright, bold colors and an innovative nectar delivery system. 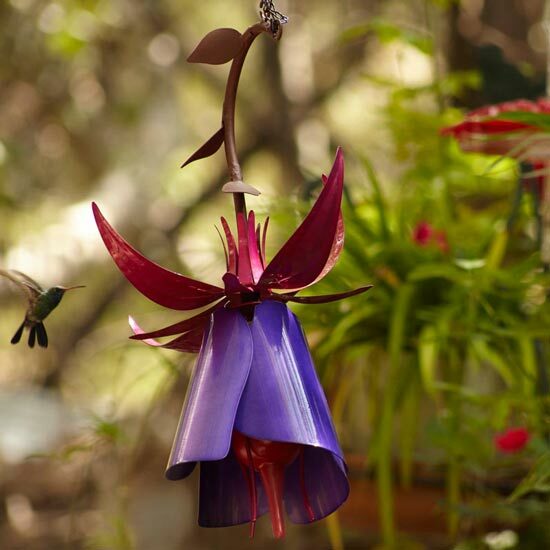 An easily refillable bottle of nectar is held in place at the center of the large flower, allowing hummingbirds to approach the bloom just as it would a real fuchsia. Makes a delightfully colorful accent piece in any garden or landscape. Includes a sturdy yet decorative hook for hanging, and can be bolted directly to a tree, bench, garden wall or deck railing. Made of weather-resistant powder-coated steel, it is sturdy enough to last a lifetime with proper care. 12¾"L x 13"W x 18"H Overall. Weighs 12 lbs.